This historic photograph shows Emilio Famy Aquinaldo, a Filipino revolutionary, politician and military leader who is recognised as the First President of the Philippines (1899-1901), in a Hupmobile. Aquinaldo also led Philippine Forces against Spain in the latter part of the Philippine Revolution (1896-1897), as well as the Spanish-American War (1898) and once again against the United States during the Philippine-American War (1899-1901). Aquinaldo was captured by American forces in 1901, which ultimately brought an end to his presidency in the Philippines. In 1935 Aquinaldo ran unsuccessfully for President of the Philippine Commonwealth, losing against Manuel Quezon. He is famously known for making a radio appeal for the surrender of the American and Filipino forces in Bataan. He was arrested as a collaborator after the Americans returned, he was however freed in a general amnesty. Today the municipality known formerly as Bailen, is called General Emilio Aguinaldo – it is a municipality in the province of Cavite. In 2012, the Provincial Board approved reverting the region back to its original name Bailen – however that name has yet to be ratified, and the name of the municipality still stands as General Emilio Aquinaldo. 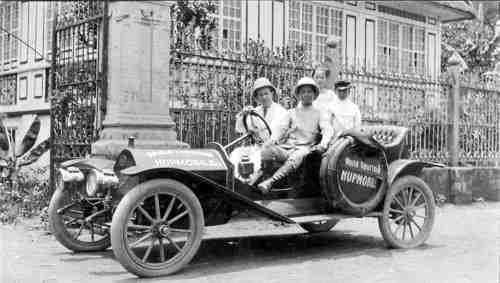 This historic photograph above shows Aquinaldo in a Hupmobile near his home in Cavite in 1911 – Hupmobile toured a large region of Luzon, even climbing into Baguio which by 1911 was a formal summer retreat in the Philippines.